Contrarian Value Investors' Dilemma: Trade Or Ignore Gold's Bounce? Last fall my gold value thesis, miners I'm buying and why - Part I reasoned why gold's bear market bottom had to be close. At least I hoped so as I was heavily buying precious metals mining stocks. With my research done, selections made and buy targets set, all I had to do was wait. Yes timing is a mug's game but when bear markets are particularly grizzly we may need to consider more than bottom fishing based on value alone. Ask anyone relying on not much more than The Force when buying mining stocks two years ago only because they were cut in half—to then go down over half again. So the first problem with fishing value is that you can buy too soon. Irrational stock prices can always become more so. The second problem is when you wait too long and miss the turn. While hoping for time to bid into a gradual U-shape bottom, prices can instead move violently higher in a V-shape like we saw in 2009 with most equity markets and over the last few weeks in gold and gold stocks. After 4-years of patiently watching gold stocks drift lower and waiting for gold to signal a bottom, the power and extent of recent price moves suggest more than the usual winter bounce. Many question if shiny metals still serve their traditional safe haven role, which seems confirmed by gold's recent buying frenzy on fears about China, oil and negative interest rates to potential European bank failures and USD weakness; but is any of this a surprise or news that was not already priced in the market? On the other hand Goldman and other analysts repeat their $1k price forecast every time gold shows strength. I hate agreeing with them and hope we are wrong but I also believe this gold bear market may not be over just yet. My reasoning is in Part I and I still think gold's bottom could be marked by a major mining bankruptcy leading to a short-covering capitulation event. Until then I doubt gold can get much above $1,300 with so many mining companies still on life support as they will not risk their jobs by missing a chance to lock in some production margin and hedge heavily by selling futures. I still think interest rates and the USD can go higher this year as the economy has a shot at delivering upside surprises if you think of lower oil and energy prices as effectively QE4 without adding debt. So we already know which stocks to buy and have avoided big losses from buying too soon, but we are not sure if gold's bear market is over or even if the price has hit bottom. After significant price moves I tend to wait for a 50% retracement before stepping back in. This often works but you risk missing out or paying even higher prices. So the third problem, especially after a powerful V-shaped bounce, is if the bottom is really in or just a bear market rally, and whether to buy now or wait. Paying attention to technical chart patterns can help time entry and exit levels and avoid value traps, needed until investors' moods become rational again. In other words I'm a contrarian long-term deep-value and growth investor but in case I get my timing wrong I tend to buy over time on dips while always keeping some cash available so that my portfolio does not all turn into long-term holds. You will see that while I focus on fundamentals first, by also identifying simple stock chart support and resistance levels this has saved me from buying too early at multiples of current prices. Keeping my powder dry until gold seemed close to forming a bottom last summer has not just prevented big losses but also provides more leveraged future returns from buying more shares at lower prices. My previous article made observations about important 2016 macro events affecting this tired 7-year bull market, and I updated some of my favourite penny stock gold producers which had technically flatlined. Many treat these stocks as verboten regardless if they are significant low-cost miners with millions of ounces, profitable and trading at a fraction of book value, with lots of cash and no debt. I also mentioned that I was holding off writing about some of the larger undervalued gold and silver producers as they were still sliding down their technical chart's wrong side of the mountain. The good news is that despite gold trending $200 per ounce higher this year, mining stocks still got slammed mid January with some of the mid-tier producers on my watchlist finally cracking key support levels. As hoped, these stocks became significantly more undervalued as they made new multi-year lows. The bad news is that before I could complete this article these stocks are now up +95%, +85% and +112% respectively as gold surged +19% from $1,061 to $1,260, now US$1,226 an ounce. I believe there is still lots of value in these stocks, especially as gold and silver prices eventually go higher. My dilemma is that a double in a few weeks is too far, too fast. To plunge in now risks being stuck in the same value trap that we have seen for over 4-years waiting for gold to finally bottom and turn. I own some gold and silver stocks so my plan is to wait for the following mid-tier producers to retrace a chunk of their recent gains over the next month or so. If really lucky these stocks might retest their lows with gold over the usual summer doldrums. My timing can always be off or I may change my mind and buy sooner as these companies standout based on value, safety and growth potential. Undervalued Mid-Tier Producers Finally Hit My Technical Buying Range... but then double! 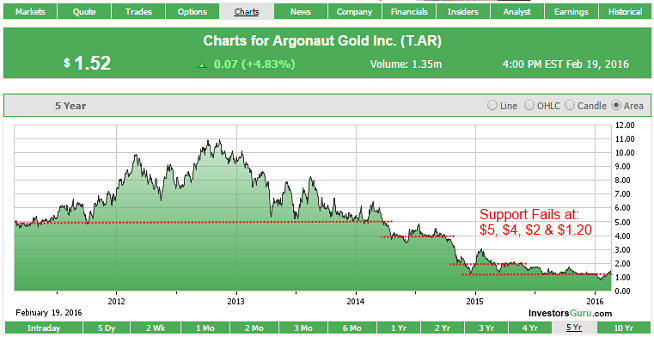 (TSX:AR)(OTCBB:ARNGF) Argonaut Gold is listed on the TSX and OTC with a 2012 high of C$11.04, now trading at C$1.52 per share. This Canadian gold company has two producing mines in Sonora Mexico called El Castillo and La Colorada, and is developing three more mines in Mexico and Canada called San Antonio in Baja California Sur, San Augustin in Durango, and Magino in Ontario. The company's website lists total M&I resources of over 11.5 million gold ounces and 42.7 million silver ounces, plus Inferred resources of 1.4 million gold ounces and 4 million silver ounces. AR's November Q3 revenue was US$32 million with positive cash flow and steady cash of US$44 million. AR's January 13 news shows 2015 production met guidance at over 139k gold equivalent ounces (GEO) with cash rising to $46 million. 2016 guidance is 130k-140k GEO at $750-$800 cash costs. January 18 news updated Magino's pre-feasibility showing a 10-year mine life, +76% reserve increase, 28% pre-tax IRR, $610 million NPV, 300k gold ounces per year and a 2.6 year payback. Other than AR's stock chart I'm having a hard time finding fault with this substantial mid-tier gold and silver producer which has two successful operating mines, lots of cash and almost no debt, plus three near shovel ready mines and exploration projects to grow further as gold prices turn. AR's balance sheet shows C$972 million shareholder's equity versus a market cap of only C$236 million. With 13+ million GEO, AR at C$1.52 minus cash values its mines at nil and its gold at under US$10 an ounce. AR has been fundamentally cheap for over two-years but luckily its chart kept me on the sideline as share prices kept failing key levels: $5, $4 and $2. With the overall market sell-off last month AR's $1.20 support since July finally broke and I knew if the key $1 level did not hold we typically could see a flush down to $0.75-$0.80. So although AR at $1.20 represents 1/5th of book value there was a shot at paying only 1/8th of book. On January 19 AR made new lows of C$0.78, now C$1.52 +95%. (AMEX:BTG)(TSX:BTO) B2Gold is listed on the NYSE MKT AMEX and TSX with a 2012 high of US$4.58, now trading at US$1.11 per share. This Canadian gold company has four producing mines: Otjikoto in Namibia, Masbate in the Philippines, and La Libertad and El Limon in Nicaragua, with development and exploration assets in Mali, Namibia, Nicaragua, Burkina Faso and Colombia. Total resources in gold ounces: Reserves of 8.6 million, M&I of 16.4 million and Inferred of 4.8 million. BTG's January 14 Q4 revenue was US$139 million on record production of over 131k ounces +18%, with record full-year revenue of $577 million on record production of over 493k ounces +28%. 2016 production and cost guidance is now 510k-550k ounces at $560-$595 cash costs and $895-$925 all-in costs per ounce. Last year Otjikoto started commercial production; Fekola's construction is underway. BTG's balance sheet shows US$1.42 billion in shareholder's equity versus a market cap of US$1.03 billion. Debt is over $400 million with the Q4 showing a new $350 million revolver and I'm waiting to update debt and cash values with BTG's March 16 financial report. BTG's charts have also kept me on the sideline as trading continued to test, languish and eventually fail the $3, $2 and $1.50 levels. Last summer's gold sell-off resulted in BTG touching 5-year lows at $0.98 to then become range bound between $1 and its previous support at $1.50. In my Part II article I mentioned reasons why the dollar support can be especially important to institutions wanting to avoid the stink of holding penny stocks. If this key level finally did fail then I thought BTG could then be cut almost in half, marked down to as low as $0.50 based on the previous two drops. 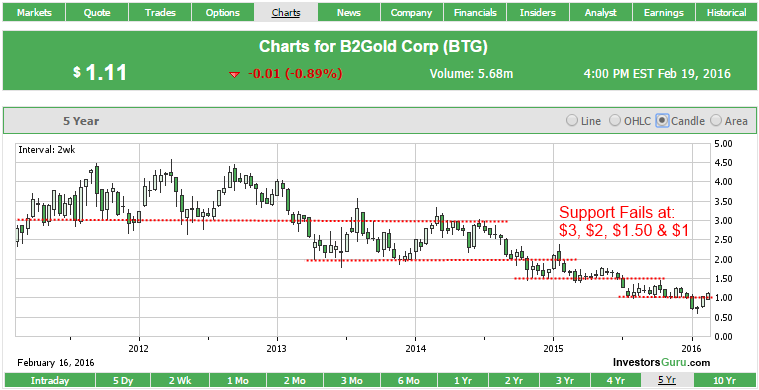 As B2Gold also trades in Canada, my guess was that if BTG got down to around US$0.70 then another wave of selling might start as BTO broke C$1. Shorts love selling into stock dropzones which can provide lots of liquidity to cover at sharply lower prices. In any event BTG's first close under US$1 was on January 8, and for BTO at under C$1 on January 19. In just a few weeks BTG fell another -40% to US$0.60 on January 25 and then bounced to now US$1.11 or C$1.50 +85%. Such a severe swing was not fully due to gold prices which have been mostly up this year. B2Gold's record Q4/FY production and guidance last month were good and do not seem to be the reason. They did file a US$300 million shelf prospectus last month which may have concerned some investors about extra share dilution, but this is effective for 25-months and may be issued in debt or any number of securities, or not at all. I still say BTG's key $1 technical share price fail was the panic trigger. (TSX:SVM)(OTCBB:SVMLF) Silvercorp Metals is listed on the TSX and OTC with a 2011 high of C$15.60 per share, now trading at C$1.27. This Canadian silver company has multiple producing mines of silver, lead and zinc with some gold: SGX and HZG with adjacent HPG, TLP and LM mines are all within China's Ying mining district. In 2014 Silvercorp started production at the GC Ag-Pb-Zn mine and non-core assets BYP Au-Pb-Zn mine was suspended and X-mines Ag-Au-Pb-Zn sold. SVM's website overview shows consolidated P&P reserves of 101 million silver ounces, 442k lead tonnes and 267k zinc tonnes, plus M&I&I resources of 229 million silver ounces, 971k lead tonnes and 693k zinc tonnes. The FY2015 production summary shows 5.12 million silver ounces, 5,900 gold ounces, 51.5 million lead pounds and 15.9 million zinc pounds, all higher except gold versus FY2014. SVM's February 5 Q3 in USD shows $9.6 million or $0.06 per share in operating cash flow, $3.3 million or $0.02 per share in net income, ~685k shares repurchased, $66.8 million cash, +13% to +14% improved head-grades at Ying, with lower all-in net sustaining costs of $7.72 per silver ounce versus last year's $10.91. The balance sheet shows $231 million in shareholder's equity versus a market cap of around $155 million at $0.92 or C$1.27 per share—about two-thirds of book value. If everything is so sterling at China's largest silver producer then why is it trading at only 8% of its 2011 highs? A few years ago SVM was targeted in a "short and distort" scheme with other China related stocks and sank even with the only evidence of fraud I can find being the charges against the hedge funds involved. Although silver, lead and zinc production was up last year, SVM's Q3 shows less profits as sales fell -15%, -9% and -33% respectively. Most of this came from lower metals prices and less ore being milled to intentionally increase its inventory of concentrates to be sold later. On August 13 SVM suspended its dividend and later that month voluntarily withdrew from the NYSE to avoid consolidating its shares just to maintain an arbitrary US$1 minimum average share price. These actions hurt SVM's share price but were rational and needed to preserve long-term shareholder value. While every producer has been trying to reduce costs to survive, I like that SVM remains profitable with room to still lower costs. Production can grow quickly at SVM's two underutilized processing plants with ore feed coming from its already huge 300+ million ounce silver resources with expansion drilling ongoing. When metals prices were higher SVM could actually produce silver at a negative cash cost after factoring in Pb-Zn by-product sales. SVM also has no debt and lots of cash to buy back up to 16+ million shares this year, about 10% of the float, under its new share repurchase program. 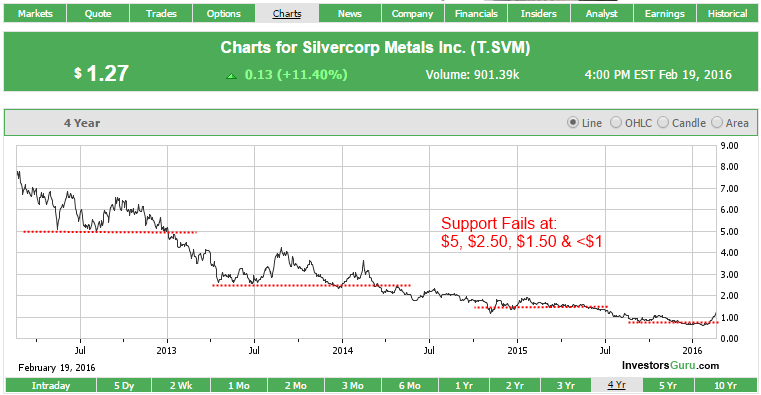 With all mining stocks limbo dancing—how low can you go—since 2011, SVM's stock charts kept me on the sideline as it continued to fail at C$5, $2.50 and $1.50, to below $1 since last summer. On January 22 SVM made new 10-year lows at C$0.60 and then bounced to $1.38, now $1.27 +112%. Successful investing starts with a well reasoned, unemotional plan. Charts can help refine your timing as long as you stick to your fundamental plan. In other words value should determine what a company is worth and the trading behaviour can indicate if you might be able to pay less or sell higher. Mining stocks are extremely volatile and it is rational to want to buy as low as possible and sell as high as possible; just be careful as greed has a way of turning patient investors into trapped short-term traders. Even if you believe gold's bottom is in, we should recognize that a double is a huge short-term gain that traders will protect on any sign of choppy waters ahead. Gold's rally may have temporarily thrown a wrench into some of my buy targets, but my plan continues to include these names on dips. As I wait, I will start writing about some of my favourite developers which have no debt, market caps barely greater than cash, with millions of discounted ounces fully leveraged to higher gold prices.